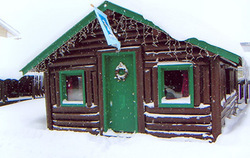 Moose Creek Cabins are located four blocks from Yellowstone National Park in West Yellowstone, Montana. Our accommodations are real log cabins and cabin rooms, which are individually decorated to reflect the beauty of the area. All cabins have two queen beds with separate bedroom, sitting area, and full kitchenettes. All cabins rooms have one queen bed, sitting area, table area, microwave, and small refrigerator. All rooms have cable TV. No pets. We are located within convenient walking distance of snowmobile rentals, Rendevous Ski Trail, City Park, and the downtown shopping area. We have an old-fashioned, on-site doughnut shop where the doughnuts are made fresh every morning. The doughnut shop also offers Montana Coffee Traders coffee, soft drinks, milk, juice, and hot chocolate. We're locally owned and operated and we will provide you with the best personal service possible. We welcome you to the cozy side of Yellowstone. Directions: Moose Creek Cabins are conveniently located right in town on Firehole Avenue and Highway 20. We are four blocks from the west gate entrance if Yellowstone National Park.